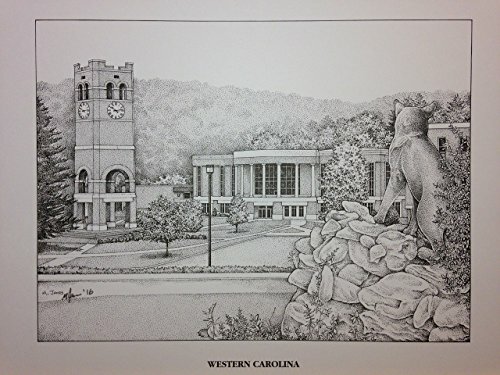 Limited Edition pen and ink print from hand-drawn original of Bell Tower on the Cullowhee campus. This scene shows the Bell Tower and the front of the Student Union with the Catamount Statue, which are prominent features on the Western Carolina campus. It is signed and dated and is from a series of 600 prints. Your purchase includes print, foam-core backing, and about-the-artist flyer within an acid-free packaging.